A painstakingly researched history of this small but fascinating coalfield. The material covers the period from the late 19th century to its final closure and encompasses the colliery of Shakespeare at Dover, several lost collieries such as Wingham and the four productive collieries of Tilmanstone, Snowdown, Chislet and Betteshanger. 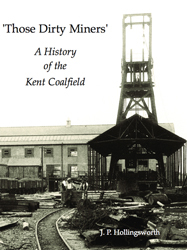 Also contains a fully illustrated chapter by Tom Heavyside on Kent’s Last Days of Colliery Steam. Full of informative detail and with many previously unpublished photographs.